Photograph taken from the book "Pioneers and Prominent Men of Utah." 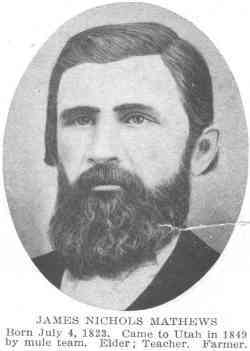 JAMES NICHOLS MATHEWS, was a MORMON SHOOTER and CLUBBER, and a 2nd Lt. in the Iron County Militia. He was the son of Knowel and Martha Ann Mathews of the southern states. Born 4, July, 1823. Came to Utah in 1849 by mule team. In 1857, Mathews moved to Washington, Washington County in southern Utah. Also that year thirty-year-old Mathews married fifteen-year-old Clara Elizabeth Slade, of Harris County, Texas, the daughter of William Rufus Slade and Julianne H. Slade. This was a Reformation-era marriage. They were married in Washington, Utah. She came to Utah in 1848 from Texas. Their family home was located in Pine Valley, Utah. In September 1857, Mathews was a 2 nd Lieutenant of the 2 nd platoon in Washington, in Harrison Pearce's Company I, part of John D. Lee's 4 th Battalion. He was probably recruited on Sunday, September 6 and his party moved north on Monday the 7 th and met Lee that evening some miles south of Mountain Meadows. The next day they moved up to the Meadows and encamped there in the "southern" encampment. Mathews specific role during the massacre on Friday the 11 th is not known. Mathews was not named in the 1859 arrest warrant. Mathews was an original founder of Washington, Washington Co., 1857. ( History of Washington County, 29, 50 fn 11.). Missionary to southern Utah to make peace with the Indians an assisted in development of "Dixie". He was an Elder, Teacher and Farmer. He died June27,1871. To find the genealogy on the above Mormon Shooter and Clubber, click here.